All across New Mexico, each restaurant, diner, and road house cafe claims to have the ultimate GCCB, and we love this. By now we’ve probably tried over half of the burgers on the New Mexico Green Chile Cheeseburger Trail. A trail we will take at any opportunity, with gusto and without hesitation. With each new place we pull into the parking lot and ask ourselves, “What do you think will make this one so special? “How will this one be different?” and “Is it crazy that we’re this excited to try a new GCCB?” Nope, it’s not crazy at all. Not when you’re in New Mexico, that’s for sure! 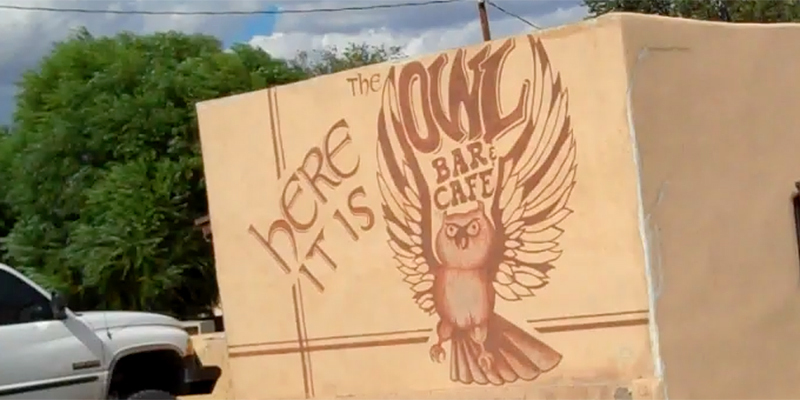 We were driving through Albuquerque looking for a place to stop for lunch when we remembered The Owl Bar & Cafe, where their claim to fame is being the creator of the first ever green chile cheeseburger. We immediately headed south for about an hour and pulled into this unassuming little place, that was so easy to find on the main drag of tiny San Antonio, New Mexico. This place is a funky, fun hang-out. With an interesting history, and we’ll get to that. Just look at this chile mothership of a burger with beef that’s hand cut and ground, hand formed and lightly packed for tenderness, cooked to order, and grilled on a flat top to perfection with a nice crusty sear. Juicy, moist, seasoned well, loads of melted American cheese, lettuce, tomato, pickles, chopped onions and their famous green chile that gives the burger that extra kick and smoky herby-ness. The juices drip down your sleeve with every bite and it is wonder-ful. The Owl Burger is one of THE TOP BEST EVER ULTIMATE GCCBs we’ve had! We looked around and realized everyone else in the entire happy holy grail of GCCB dining room had ordered an Owl Burger. And we get it. It’s not a gourmet brioche buttered bun with smoked gouda and caramelized onions with truffled foie gras fries kind of place or burger. 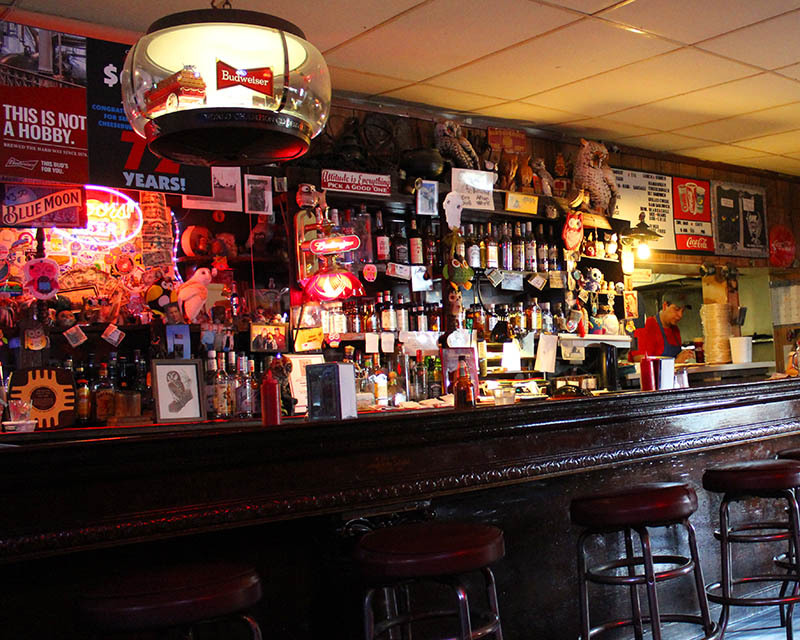 It’s a legendary mom-n-pop no-frills landmark with darned fabulous burger fare, the best green chiles, hand cut fries, and full bar. What’s not to love? As we were eating, the song “At laaaaaaast, my looooove has come along” began to play in the dining room. Did it hold a special meaning that day? You bet it did. Did we sing along with it? You bet we did. Their secret green chile recipe has not changed since 1948, and is made fresh every day. And it makes sense that the GCCB would originate in San Antonio, only 1 1/2 hours from the Chile Capital of the World, Hatch NM. World Famous is right. People come from all over the globe for the Owl Burger. The 25-foot mahogany bar was originally from Conrad Hilton’s first rooming house right in San Antonio. 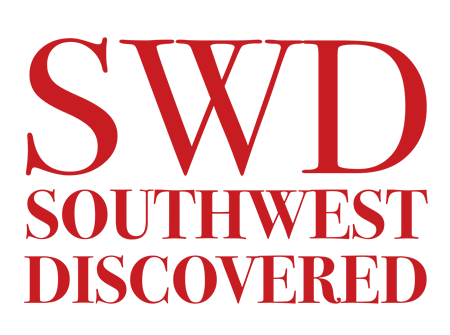 Hilton was born there and his family ran a store / boarding house / hotel in Socorro County. 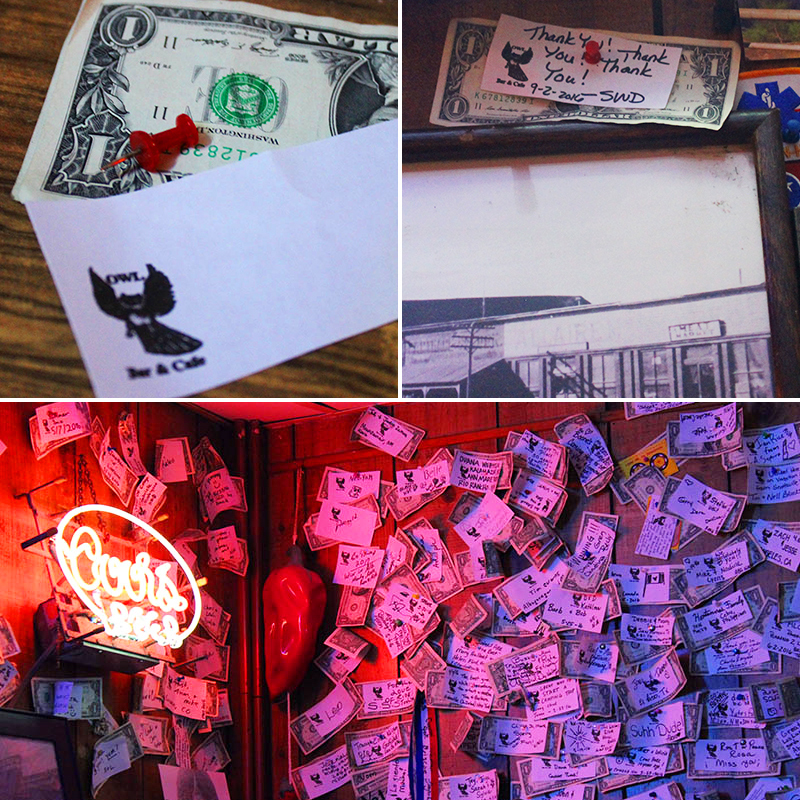 Customers attach dollar bills to the walls, with their names and messages. Once a year the bills are removed and donated to various charities. The Owl is family-owned since 1945. Some of their earliest customers were scientists stationed in New Mexico to work on the Manhattan Project. 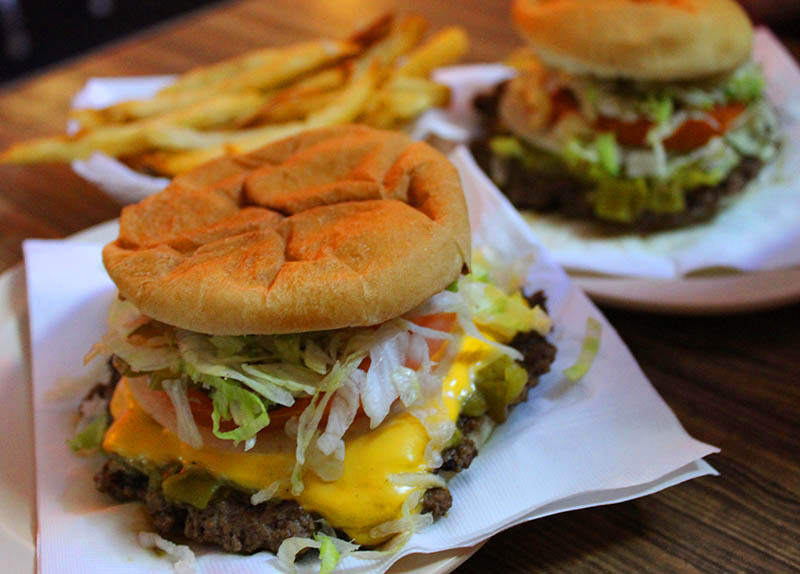 If you’re anywhere near San Antonio, NM, you have to stop and try this burger. This was one helluva discovery that we plan on re-visiting again and again. Buen Provecho and GCCBs Rule! I don’t see the point of making a burger without chiles and this one is a sure thing. We’ll drop by next week! Thanks for the reminder! ChileSage, agreed. 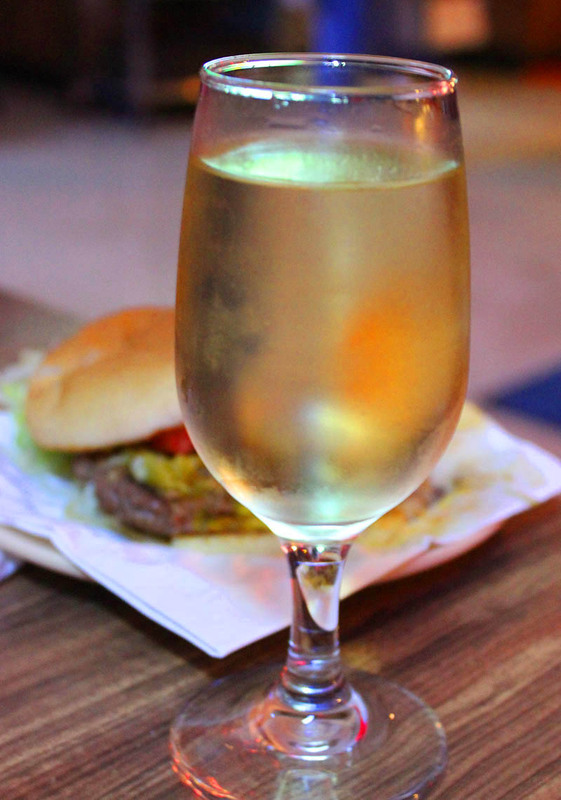 A burger without green chile just does not seem right. 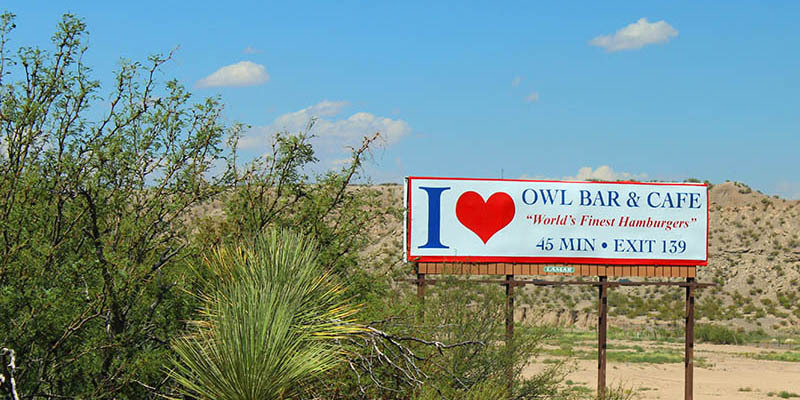 Have a terrific time at the Owl! This is one of those places you might drive by and never know how special it is. 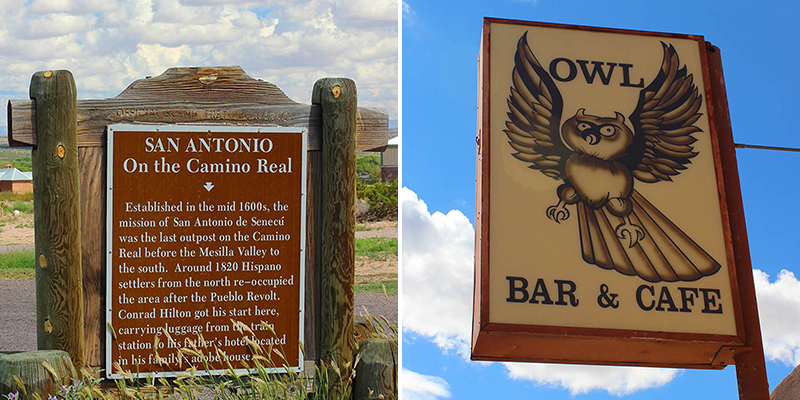 Great post and we’ll be checking out the Owl next time we’re near Albuquerque or driving down to Las Cruces. Az Sunshine, we would have done exactly that had we not checked around and spoken with fellow GCCB Trail followers. When you go, take pics and send them so we can share with everyone! Don’t even think about getting between me and a GCCB today. I need one like nobody’s business after reading this one. True Blue, it’s funny you’d mention this because we had to take a break from writing this article to go get a GCCB! Buen provecho! 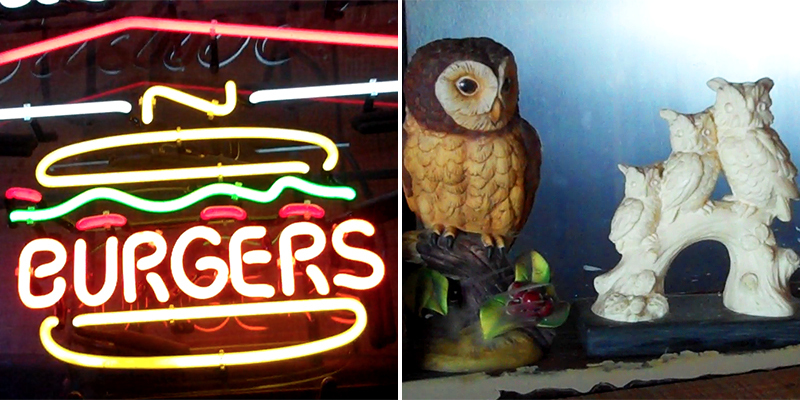 We love the Owl Burger and it’s everything you described. Top best ever ultimate and a no frills cool place. Shannon & Drew, we’d stop there again in a heartbeat. Next time you go, pls send pics and we’ll share with everyone!